they know how to craft email campaigns that get delivered, get opened, and most importantly...get clicked. 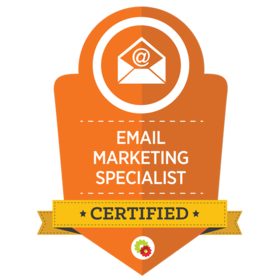 Recipients of the "Certified Email Marketing Specialist" designation must complete an advanced, 7 module, 48 lesson online course and pass 7 quizzes and a final exam that tests on the full spectrum of email tactics and strategies, including both fundamentals as well as advanced, proprietary methodologies. When combined with the education, this final exam ensures the public that the recipient has attained a level of competence appropriate for professional practice.